The global theater linen market for healthcare application is moderately fragmented with no individual player holding a dominant share of the market. The market features a large number of linen manufacturers on regional basis, which is leading to intense price competition. It has also resulted in lowered switching cost for buyers, states a new report by Transparency Market Research (TMR). Some of the notable manufacturers of theater linen are Towel & Linen (Pty) Ltd, ImageFIRST Healthcare Laundry Specialists, Inc., and Synergy Health PLC. The initial capital investment is low and this is encouraging numerous small-scale players to enter the market, thus pushing market competition and also increasing the bargaining power of buyers. 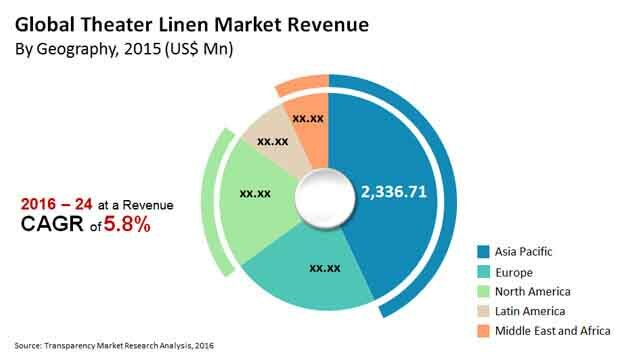 According to the research report, the global theater linen market for healthcare application was valued at US$5,434.2 mn in 2015 and is expected to be worth US$8,947.2 mn by 2024, expanding at a 5.8% CAGR from 2016 to 2024. By material type, the disposable/single use segment will lead in the market through 2024. This is because healthcare facilities prefer disposing off used linens, rather than paying for laundry and maintenance. On the basis of geography, Asia Pacific led in the theater linen market in 2015. The past few years have seen a heightened awareness level among patients regarding hygiene on account of a growing number of hospital acquired infection cases. This in turn is inspiring the healthcare industry to invest in theatre linen, thus boosting the market. The demand for clean theatre linen, especially in operating theaters is expected to rise in the coming years as the usage of dirty linen can lead to the spread of contagious diseases and hospital acquired infections. The growing investments by healthcare service providers for a sophisticated and high quality facility for patients are boosting this market’s growth. Although linens have significant monetary value, they are given less attention owing to their cost to healthcare facilities. The loss incurred due to linen mishandling and linen vanishing such as towels disappearing or sheets being torn are some of the factors resulting in a decline in the demand for theater linen for healthcare application. As per research, in the U.S., 90% of the linen used in hospitals does not reach the intended user. Due to this, U.S. had to endure a whopping US$840 mn in 2014. If the issue is not solved effectively anytime soon, it is expected to have a negative consequence on the consumption of theater linen in the healthcare sector in the coming years. The global increase in the number of ambulatory surgical centers is expected to boost the market. In addition to this, increase in hybrid operating rooms is also likely to create significant demand for theater linen for healthcare applications across the globe. Moreover, since healthcare sectors across the globe are encouraging the development of ambulatory surgical centers in order to provide proper and sophisticated diagnosis to patients. This will further the demand for theater linen, creating opportunities of growth in the market. “Significant funds are also being allocated in the direction of improved medical equipment and clean and tidy linen, which will further bolster the global theater linen market,” states a TMR analyst.